Some people can point to a book that changed their life, but for Daniel S. Chen, it was a single journal article. Published in the Proceedings of the National Academies of Sciences in 1993, it described how injecting genetically modified and weakened melanoma cells that secreted immune stimulating factors could protect mice against the growth of future melanomas – the most deadly form of skin cancer. Ever since that moment I have been fascinated with the idea of how we can use what is one of the most important and powerful systems in the human body – the immune system – to fight cancer,” says Chen, Vice President, Global Head of Cancer Immunotherapy Development at Roche. For decades, researchers trying to devise new treatments for cancer have focused on its abnormalities – whether it’s the unusually rapid growth of malignant cells, or the genetic mutations that set them apart from healthy cells. But now, many researchers are instead trying to enhance the efficiency of a normal process: the recognition and destruction of cancer cells by the immune system. Robin Taylor, Cancer Immunotherapy Franchise Head at Roche. In fact, the idea of harnessing the immune system to fight cancer is a new twist in a very old tale. During the 1890s, a New York-based surgeon called William Coley began injecting patients with bacteria to cure them of their cancer. ‘Coley’s Toxins’,1 as they became known, provided some of the first evidence that stimulating the immune system could cause tumours to shrink or disappear. The resurgence of immunotherapy comes from an appreciation that the immune system evolved to battle highly variable and complex foes. But others failed to replicate Coley’s results, and the invention of radiotherapy, and then chemotherapy – both of which destroy rapidly growing cells – soon eclipsed his approach. Yet, targeting rapidly growing cells has drawbacks. As well as killing cancer cells, it also damages some healthy cells and can result in unpleasant side effects. More recent approaches to fighting cancer have focused on the genetic mutations that drive its abnormal growth. Targeted therapies, such as monoclonal antibody-based drugs, can be designed to bind to specific proteins on the surface of cancer cells, which often occur as a result of these mutations. However, cancer is extremely adaptable. Even if you kill most of the damaged cells, some may evolve and develop resistance. The resurgence of immunotherapy comes from an appreciation that the immune system evolved to battle highly variable and complex foes. When you take cancer and its core concept of genetic variability and adaptability, the human immune system is uniquely designed to fight it. Rather than recognise just one aberrant protein, the immune system often identifies multiple proteins, which makes it harder for cancer cells to escape being detected and destroyed. The immune system also has the ability to develop so-called ‘memory’ cells, which should detect and destroy cancer cells if the tumour starts to regrow – even many years after the initial therapy ceases. The immune system is recognising and eliminating mutated cells in healthy people all the time. However, for unknown reasons, this natural surveillance system sometimes fails, and when it does, you may develop cancer. The aim of immunotherapy is to strengthen the immune system’s ability to do its job. Developed in the last decade, checkpoint inhibitors block the binding of a specific protein, such as PD-L1, which would otherwise act as a brake, allowing T cells to recognise and attack a cancer cell. The real shift came around ten years ago, when clinical trials of drugs called ‘checkpoint inhibitors’ started to generate positive results. Unlike earlier immunotherapies, these drugs work by targeting a specific set of T cells – those that have already been primed to recognise the tumour – and in a very specific context. Some cancer cells produce a protein (generally termed a ‘checkpoint’) on their surface that T cells recognise as a brake, or a signal to hold fire. “The checkpoint inhibitors basically remove that brake,” says Ira Mellman, Vice President of Cancer Immunology at Genentech. When the research review board said “yes”, it was a very special moment for Chen, Mellman, and the team, and he has deliberately kept hold of the emails that circulated in the wake of that decision, to remember the jubilation they all felt. It turned out he had good reason to do it. In 2013, the leading American journal Science named cancer immunotherapy its ‘Breakthrough of the Year’ – largely off the back of data from trials of checkpoint inhibitors. Yet checkpoint inhibitors alone still only deliver transformative benefit for some 20–30% of cancer patients, and certain cancers don’t seem to respond to them at all. Figuring out why the immune system can be provoked into rejecting cancer in some patients, but not others, is now a core component of Roche’s research and development strategy. A key part of this has been the development of the idea that tumours, it seems, can be broadly split into three groups, or ‘phenotypes’, depending on their immune response. 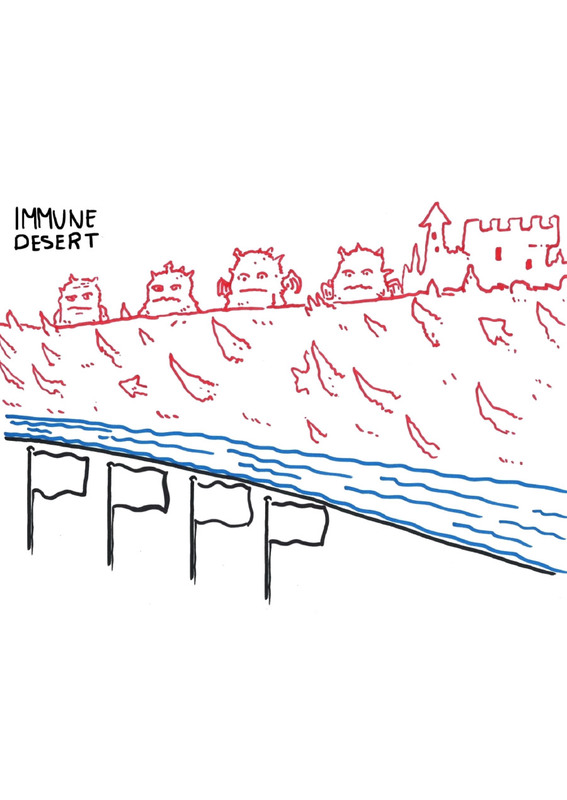 When no T cells are found in or near the tumour, this is an ‘immune desert’. If T cells are present, but for some reason unable to infiltrate the tumour, you have an ‘immune-excluded’ phenotype. Finally, if T cells are found inside the tumour, but for some reason they are prevented from destroying it, it’s an ‘inflamed’ phenotype. 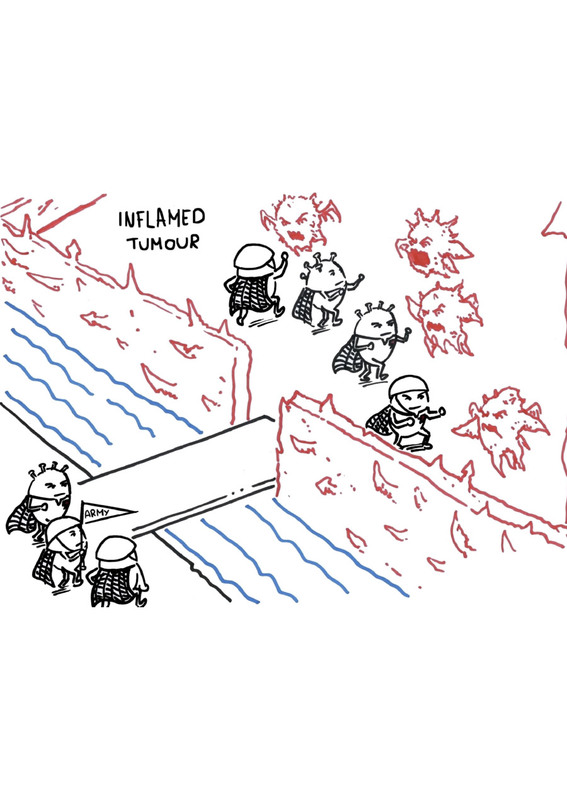 Generally speaking, inflamed tumours seem to be the most likely to respond to immunotherapies, so one question is how to encourage T cells to better recognise and infiltrate tumours in the other two phenotypes. There is a total lack of immune response. The T cell army is not present in the vicinity of the tumour, and the tumour is not attacked. There is an ineffective immune response. 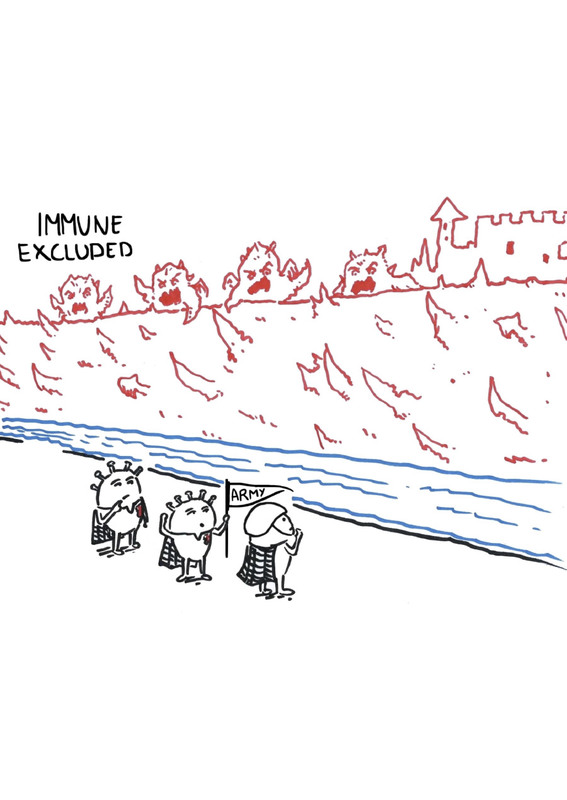 The T cell army is assembled at the site of the tumour, but unable to mount an attack through the walls – imagine the army is unable to scale the walls or cross the castle moat in order to attack effectively. An active immune response is seen. The T cell army has recognised that a tumour has grown, assembled, and is ready to attack. However, there may still be some inhibitory factors that prevent the T cell army destroying all of the cancer cells. The cycle is important because it tells us what needs to happen to have a successful immune response to cancer. It also helps us to define rational combinations of immunotherapies that are likely to work for the individual patients we treat. For instance, someone carrying an ‘immune desert’ tumour may have defects in steps one to three of the cycle: the recognition of the tumour as foreign, and the recruitment and activation of T cells. In the case of an ‘immune-excluded’ tumour, they may have defects in steps four and five: the transport and infiltration of activated T cells into the tumour. Meanwhile, the T cells of someone with an ‘inflamed’ tumour may be struggling to identify which of the cells within the tumour are malignant, or to see through the job of killing them. “We are developing a pipeline of new drugs that target each of these steps. One approach being investigated for patients with immune deserts is to try and generate immune cells capable of recognising the tumour, using a personalised cancer vaccine specific to an individual patient’s tumour”, says Mellman. Other drugs in the pipeline seek to stimulate infiltration of T cells into a tumour, or to reinvigorate existing T cells so that they can keep going and do their job of killing cancer cells – something that should benefit immune-excluded phenotypes and inflamed phenotypes. Such approaches aim to bolster existing immunological processes, by augmenting or blocking what’s already there. However, some companies, including Roche, are also developing drugs that aim to stimulate what is called ‘synthetic immunity’. One example is T-cell bispecific antibodies, which have been designed to bind to one protein on the surface of a tumour cell, and a different protein on a T cell, pulling them together like a magnet. The idea is to redirect T cells in your body – it doesn’t matter what they’re currently primed to attack – and repurpose them to attack the tumour. Bispecific antibodies could be particularly useful for patients with immune deserts, but they could also benefit other phenotypes. Such is the complexity of the immune system, with its huge repertoire of checks and balances, there’s a growing recognition that effective immunotherapy will require a multi-pronged approach. “No single drug can do all of the different jobs needed to effectively engage the immune system,” says Umaña. This means that the successful immunotherapies of the future are likely to be given as combinations with treatment such as radiotherapy, chemotherapy, targeted drugs or other immunotherapies – and tailored to the particular biology of patients. Ultimately, the goal is to build drug regimens that are tailored to the needs of individual patients, known as personalised cancer immunotherapy – and ones that will finally enable their immune systems to do what they’re designed to do and overcome the enemy within. In the future, we hope that a patient with cancer will be able to walk into a doctor’s office, have a piece of their tumour biopsied, so that we can understand what’s wrong with their immune response, and then receive a therapy tailored specifically for them. Either way, we’re on the threshold of a new era for cancer treatment. After years of downplaying the possibility, researchers are even starting to talk about the potential of cure. The immune system has a fantastic memory. Once it has recognised a target, it finds it difficult to forget it – even if its foe tries to hide, moves to a different location, or resurfaces after years of lying hidden. Possibly, all it needs is a little help to get started. Cancer Research UK. What is Coley’s toxins treatment for cancer? Available at: http://www.cancerresearchuk.org/about-cancer/cancer-in-general/treatment/complementary-alternative-therapies/individual-therapies/coleys-toxins-cancer-treatment. Accessed September 2017. Chen DS and Mellman I. Oncology meets immunology: The Cancer-Immunity Cycle. Immunity 2013; 39(1): 1–10. Accessed September 2017. In recent years progress has been made in developing cancer immunotherapies that target specific aspects of an individual’s tumour. Cancer immunotherapy stimulates a patient’s immune system to target and kill cancer cells.